I am so very excited for September this year... August came and went in a flurry of travel.. site-seeing, visiting old friends and shopping. It was wonderful but very helter skelter. I had no real focus but concentrated on transitioning from one vacation to the next. September is traditionally a month where I knuckle down and get serious about ditching the couple of pounds I normally gain every Summer... start real workouts on a consistent basis, and enjoy running again. I expect nothing less this year and am actually starting today! I love the Weight Watchers Simple Start Plan... good clean eats.. lots of lean protein, freggies, lean dairy, along with a few indulgences. And it goes hand in hand very nicely with The 21 Day Fix, which helps with portion control. I am also tracking my macros on FitDay... I know this all sounds a bit obsessive, but I am determined! And I also really love the Metabolic Aftershock bodyweight workouts. They are only 15 minutes long, and then a short stretch and half-hour walk finish them off. There are 3 workouts each week. I feel energized and strong after I finish a session. So these will be the backbone of my September Simple RE-Start Program... and on the 'in-between' days I want to run, play tennis, perhaps golf a bit, swim, get in some yoga and Pilates and do lots of walking. p.s. I loved our vacation to Colorado. Do you have a focus for the month of September? August was very crazy for me, too -- so much so that I'm struggling to wrap my mind around the fact that tomorrow is September!! I haven't even thought about my goals for the new month (very unlike me)!! 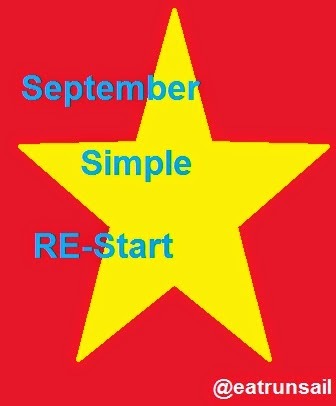 Good luck on your September restart! I am looking forward to detoxing from my vacation and really getting in some great training for the NYC MArathon! We just back from a mini vacation so we here ya on getting back to our normal routine! Great goals! I'm with you on getting back into a routine. Can't wait to hear about your travels! I agree: August flew. Good to settle back into some sort of routine. Goal for September is to keep building toward NYCM. Wow sounds like you had a great summer Elle! I'm jealous that you got to go to Colorado;) I've never been but have always wanted to visit:) Yes, September will definitely be a restart month for me too:) The boys went back to school today and I am ready to get back at it!